TEMPERATURE MEASUREMENTS FOR SEEPAGE MONITORING IS GAINING RAPID ACCEPTANCE AS A METHOD FOR MONITORING SEEPAGE IN EMBANKMENT DAMS. THIS PROJECT WAS CARRIED OUT BY HYDRORESEARCH USING SENSORNET’S TECHNOLOGY. This method has been used successfully especially in Germany and in Sweden, where HydroResearch has introduced and improved the method and the evaluation. 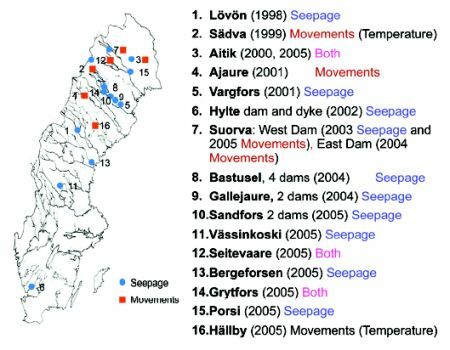 Temperature measurements have successfully been used in about 30 Swedish dams since 1987, both for limited monitoring/investigations and for long term monitoring. The reliability of temperature measurements was also showed in an international study, where different methods were used to detect three unknown seepage locations. This method is now also recommended in the Swedish Guidelines for dam monitoring. sites in Sweden have been equipped with temperature sensing fibres (see figure 1). The seepage monitoring method uses the seasonal temperature variations that occur in all surface water (such as lakes, reservoirs and rivers) which causes a seasonal variation of the seepage water that passes through a dam. The magnitude of this seasonal temperature variation can be measured in the dam and is correlated to the seepage flow through the dam (see figure 2). from the boundary to the measuring point. Distributed Temperature Sensing using optical fibre offers an extended information level compared to point information achieved from single temperature sensors. The fibre can be installed both along the dam and vertically in open standpipes and the DTS information can be compared with measurements in open standpipes. The recent development of the Sentinel DTS by Sensornet has provided a remarkable improvement in temperature measurement accuracy, allowing very small temperature changes to be detected (0.01°C). Seepage flow anomalies can then be detected and evaluated just from the natural temperature variations observed after a few days of measurements.